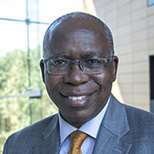 Dr John Opute is a member of the academic staff of the School of Business, and is Senior Lecturer in the Division of Management, Marketing and People. He is also Course Director of the MSc in International Human Resources. Dr Opute has over twenty years of industry experience in General Management and Human Resource Management. He has held key management and HR positions in several multinational companies such as Alcan Aluminium Company of Canada (with major responsibility in Nigeria) and Cincinnati Bell in Ohio, USA. He has a diverse educational background: first degree/diploma in Business Administration (with major in Management) from Nigeria, an MBA from the USA and a PhD from the UK. He belongs to various international associations including the International Industrial Relations Association. His current research activities are in the areas of International HR, Rewards Management and Employee Participation, particularly in developing economies. Rewards Management: This is from the perspective of monetary and non-monetary rewards, and how rewards can be used as a strategic/competitive tool for an organisation, particularly in a globalised world. Comparative International HR: This is from the perspective of developing economies versus the developed economy and how the contextual issues can impact of the decisions organisations make. Areas of further focus in this respect are trade unions and their relevance, and the impact of culture.